A cross-section of healthy retina shows S-cone bipolar cells (marked by *) in the inner nuclear area. 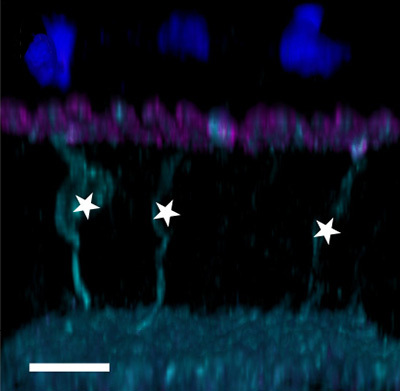 Each bipolar cell sends a single dendrite toward the photoreceptor ribbons (magenta) to synapse with a single S-cone photoreceptor (blue). (Image credit: Beier et al, 2018, Current Biology). Bipolar cells left without a connection to a photoreceptor start to grow new branches, called dendrites. This image shows two S-cone bipolar cells (marked by *) contacting the same S-cone axon terminal (arrowhead). The dendrite from a deafferented S-cone bipolar cell bypasses M-cones to synapse with new S-cones. (Image credit: Beier et al, 2018, Current Biology). The brain's ability to form new neural connections, called neuroplasticity, is crucial to recovery from some types of brain injury, but this process is hard to study and remains poorly understood. A new study of neural circuit repair in the retina shows that neurons can make new connections to the right types of photoreceptors to restore selective connectivity after an injury. "It is essential to understand these processes because we don't get new neurons in the central nervous system, and even if we learn how to introduce new neurons, we still need them to integrate in the correct way. Here we show there is a mechanism in adult mammals to ensure the correct connections are made," said Alexander Sher, associate professor of physics at UC Santa Cruz and corresponding author of the new study, published May 24 in Current Biology. Vision loss from diseases such as age-related macular degeneration and retinitis pigmentosa results from degeneration of the light-sensing photoreceptors in the retina. Medical researchers have begun to explore potential therapeutic strategies to replace the lost photoreceptors. This approach could only work, however, if the new photoreceptors could be connected properly to the neural circuitry in the retina. "Our findings provide some hope that if new photoreceptors can be introduced and survive, the correct connections could be reestablished," Sher said. Sher and his colleagues took advantage of a unique pattern of connectivity in the retinas of ground squirrels, which makes it easy to track changes. Like most mammals, ground squirrels have two types of photoreceptors for color vision: S-cone photoreceptors sensitive to short-wavelength light and M-cones sensitive to medium-wavelength light. The neurons that connect to the photoreceptors and transmit signals from them are called bipolar cells. In ground squirrels, each S-cone bipolar cell connects to only one S-cone photoreceptor and vice versa, resulting in a one-to-one connection between S-cones and S-cone bipolar cells. "It's a nice trackable circuit, and people have developed antibodies we can use to label both S-cone photoreceptors and S-cone bipolar cells in the retina and see what happens if there is an injury that leaves bipolar cells with no input from a synaptic partner," Sher said. The researchers found that bipolar cells left without a connection to a photoreceptor start to grow new branches, called dendrites. As the new dendrites of S-cone bipolar cells randomly explore the retinal layer where synapses are made, they bypass any M-cones they encounter and only form new synapses with S-cones. "This tells us that selective connectivity can be reestablished in an adult mammal, which had not been shown before," Sher said. "How this might translate into other parts of the brain, we don't know. But for the retina, it shows we might be able to make new connections after photoreceptors are lost." Sher noted that ground squirrels might have an advantage over humans in this respect, because changes are known to occur in their photoreceptor synapses while they are hibernating. It's possible that the molecular mechanisms available to ground squirrels might not be available in the human retina, he said. "There are still a lot of unknowns, but the more we learn about these processes the better off we are," Sher said. In addition to Sher, the authors of the study include first author Corinne Beier at UC Santa Cruz (currently at the National Institute of Mental Health) and coauthor Daniel Palanker at Stanford University. This work was supported by the Burroughs Welcome Fund, Pew Charitable Trusts, and National Institutes of Health.